Southeastern Alabama’s Wiregrass Museum of Art is located in Dothan, Alabama. The museum’s mission is to inspire a lifelong appreciation for the arts in each visitor through educational programming, display of the permanent collection, and temporary exhibits. The Wiregrass Museum of Art collects American fine art, decorative arts and design work from the 20th century to the present. Most of the items in the collection are works on paper. Over 1,100 items make up the permanent collection, which includes the largest public collection of prints by the American artist Frank Stella, known for his minimalist and abstract paintings and sculptures. Other highlighted artists among the collection include Victor Vasarely, Joseph Albers and Robert Indiana. A collection focused on contemporary Alabama art includes the work of Scott Stephens, Carolyn Sherer, Beverly Erdreich and John Kelly Fitzpatrick. An exhibit of works from the museum’s collection is permanently on display. Pieces occasionally rotate, and works from the permanent collection often serve as inspiration for the museum’s temporary exhibits. History: The Wiregrass Museum of Art was founded in 1987 in response to a national magazine article that referenced Dothan’s lack of a museum. The mayor at the time, Larry Register, quickly mobilized a panel of 13 citizens to study the feasibility of a public museum. 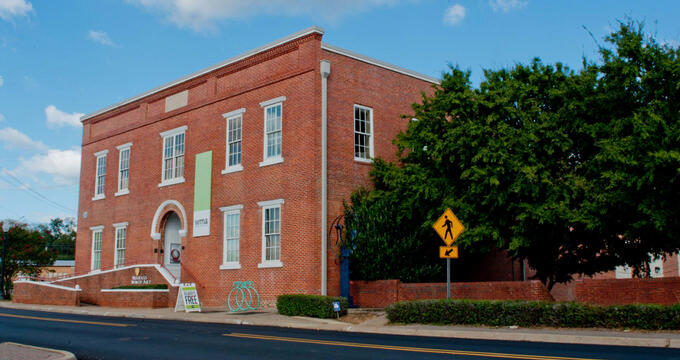 The Wiregrass Museum of Art is city managed and is housed in Dothan’s historic Water and Electric Building. Originally built in 1912, the building is listed on the register of National Historic Places. The building was renovated and converted to a museum by local architects Joseph L. Donofro and Associates after twenty-one architectural firms were asked to submit proposals. The 30,000 square foot museum took approximately $3 million to complete. The original feasibility committee was appointed as the museum’s first board of directors, and a four-stage plan was hatched for fully readying the museum for the public. Three of the four phases are now complete including the completion of 18,000 square feet of gallery space, storage and preparation space and a conference center, plus the offering of educational programming, and the hosting of traveling exhibits. Ongoing Programs and Education: Guided tours are offered daily by trained docents or museum educators. Group tours may be customized to meet the interests and needs of the group. Educator resources are available for teachers and other group leaders to supplement their group’s visit. Topics include Alabama Landscape, Art from Recycled Materials, and Habitat Design among others. Classes and workshops offered by the Wiregrass Museum include studio art classes for both youth and adults. Special workshops are led by visiting artists and have included indigo dying, origami and printmaking. Additional youth programming includes summer and winter art camps. First Saturday Family Day offers free arts and crafts activities for families, such as weaving, fabric dying, painting and sculpture. Youth Art Month takes place each March and displays juried artwork made by local children in addition to offer a variety of free educational and hands-on programming in studio arts and writing. Events at the museum include Art After Hours, a quarterly celebration of new exhibits. The Thursday evening art openings offer food and small bites, and often include artist’s talks. Screen on the Green is a quarterly film series. Guests are encouraged to bring their own chairs and blankets for the outdoor event, and food trucks provide snacks and dinner. Yoga in the Galleries takes place the first Friday of each month. Yard Party for Art is an annual art and live music festival that happens each August. Past and Future Exhibits: Many of the museum’s temporary exhibits are inspired by works in the permanent collection. “Echoes” is on display through December 2018 and displays work made by members of the Alabama Caucus for Women’s Art in response to works in the permanent collection. Over 20 artists are featured in the exhibit, including Patty Driscoll, whose “Lydia’s Purple,” a 2015 oil on panel presents a traditional still life with a feminist theme. “Walks in the South” will be on display from January through March 2019. The show will feature the 2016 photography of Sydney A. Foster. The Alabama artist captures stories of every day people on the streets of Montgomery, Alabama. Upcoming from April to June of 2019 is Beverly Erdreich’s “Continuum” series. Each work on paper incorporates a detail from Goya’s 1808 Disasters of War series, with contemporary elements that remind the viewer how little the world has changed.